In Monday’s Denver Post there was an article titled “Top Online Scams: McAfee’s Seasonal Consumer Warning” about this Holiday Season’s top internet scams directed at consumers. 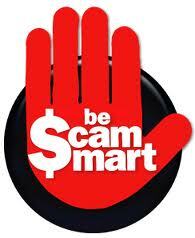 There are more and more scams appearing in every facet of the internet these days including social media. Most people are on Facebook and Twitter so be very careful what you click on in these sites especially since most of your “friends” aren’t really your friends. In today’s society social media is very prevalent in most people’s lives. Facebook and Twitter are now sites for scammers to prey on innocent consumers. McAfee advises to be careful this holiday season especially when it comes to liking or clicking on posts or participating in contents and deals. Mobile App Scams: Buyer beware they are out there this Holiday Season! Now it seems most everyone has a smart phone and so the creation of mobile apps has been steadily on the rise. Beware of the apps you download to your smart phones and/or tablets as these could be designed to steal your information and could even send out premium-rate text messages from your device! Too-Good-To-Be-True Travel Deals:Scammers know that with the holidays comes increased travel and they are jumping at the opportunity to steal your personal and financial information. They will create fake travel websites designed to do just that. Be very careful when you come across a deal that seems too good to be true because it may just be. Online scammers are out there more and more these days – especially around the Holidays. Be very careful where you buy from online and who you buy from as it could potentially be a scam. Be Scam Smart This Holiday Season. If anything seems too good to be true, unfortunately in this day and age, it most likely is. Do your due diligence before you click on anything. Often times scammers will create a fake contest claiming to be giving away a free iPhone or iPad. The links usually contain a virus that will damage your computer and get you to reveal your personal information. Skype Scam: There is a Skype message scam out there currently. This software is designed to infect your computer/device and can even take your files! Third Party Gift Cards: Try to buy gift cards directly from the store or store’s website rather than using a third party. Scammers are known to produce fraudulent gift cards and concert tickets that you won’t be able to use or get your money back for. 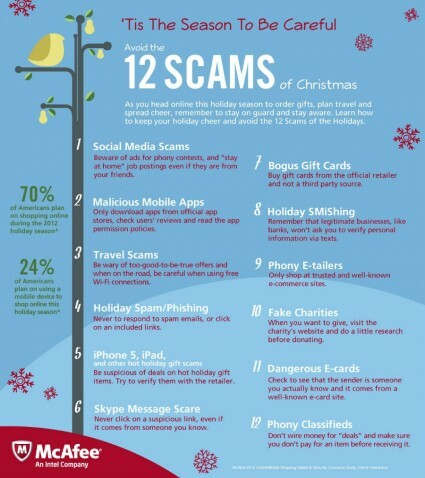 McAfee Internet Security Company’s Top 12 Holiday Scams to be on the lookout for. 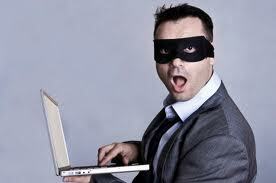 Technology is a wonderful thing but there is so much more risk these days for fraudulent transactions to occur. Please be savvy this holiday season when shopping online for holiday gifts or utilizing social media. Scams happen all the time. Please don’t let these affect you!